de Oliveira V.M., Chamas P.P., Goldfeder G.T., Larsson M.H. 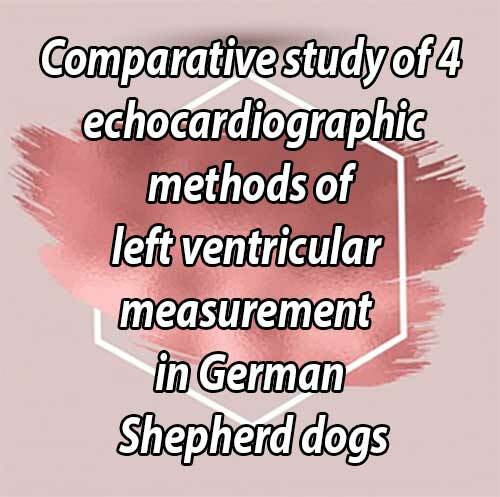 Comparative study of 4 echocardiographic methods of left ventricular measurement in German Shepherd dogs // J Vet Cardiol. 2014 Mar;16(1):1-8. OBJECTIVES: To compare dimensions and shortening fraction (SF) of the left ventricle (LV) obtained from two-dimensional (2D) and M-mode imaging of short and long-axis views. ANIMALS: 40 healthy, adult German Shepherd dogs. METHODS: Left ventricular measurements were obtained using 4 echocardiographic methods: M-mode in short and long-axis and 2D imaging in short and long-axis. The methods were compared by studying the effects of imaging mode and axis on LV parameters, taking into account the influence of weight and gender. RESULTS: Mean LV end-diastolic diameter was greater in short-axis views. However, this difference was not considered clinically relevant. Mean SF was higher when derived from 2D measurements with poor agreement among methods. A combined influence of axis, gender, and weight was observed on interventricular septal thickness in end diastole with poor agreement among methods. CONCLUSIONS: Some LV parameters were significantly affected by mode and axis, either in isolation or in combination with weight and gender, although the differences observed were not always clinically relevant. These findings show that using the different echocardiographicmethods interchangeably to assess LV dimensions should be done with caution. We therefore hypothesized that these factors could lead to significant variations in LV measurements and consequently to the normal canine reference range obtained by different echocardiographic methods. The aim of this study was to compare the left ventricle measurements and shortening fraction (SF) of healthy dogs acquired by 4 methods routinely used in veterinary medicine: M-mode imaging in short-axis, M-mode imaging in long-axis, 2D imaging in short-axis, and 2D imaging in long- axis. These techniques were compared while taking into account the possible effects of physiological variables on LV dimensions. Furthermore, the agreement among the methods was assessed to search for the clinical relevance of the differences found. Only adult German shepherd (GS) dogs were selected to avoid the effect of breed and age and therefore minimize the number of physiological variables influencing the LV parameters. The exclusion criteria consisted of the detection of cardiovascular anomalies, respiratory disease, neoplasia, anemia, obesity, infectious disease, and endocrine, renal, or liver disorders. The dogs were recruited from private owners, commercial kennels, and the police department of Sao Paulo City. Fifty-one adult GS dogs were examined. Each dog underwent a complete physical examination, clinicopathologic tests (complete blood count, urea, creatinine, aspartate aminotransferase, alanine aminotransferase, alkaline phosphatase, total protein, albumin, glucose, sodium, potassium, and urinalysis), thoracic radiography, ECG,a systolic blood pressure measurement using Doppler,b and echocardiography.c Forty dogs ful¬filled the criteria and were included. This study was conducted with the approval of the Bioethics Commission of the Faculty of Veterinary Medicine and Zootechny of the University of Sao Paulo. The short-axis view measurements were performed at the chordae tendineae level, and the long-axis view measurements were performed at the level of the tip of the open mitral valve, as recommended.6,8 The mean of 3 measurements was considered for the analysis of the following parameters: interven¬tricular septal thickness in end diastole (IVSd) and in end systole (IVSs), LV free wall thickness in end dia¬stole (LVFWd) and end systole (LVFWs), LV end- diastolic diameter (LVEDD), LV end-systolic diameter (LVESD), SF, and HR. The SF was determined by the following equation: SF (%) = ([LVEDD - LVESD]/ LVEDD) x 100%. The HR was obtained by measuring R peak-to-peak time on simultaneous ECG. The data were tested for normality using the Kol- mogorov—Smirnov test and reported as mean and standard deviation (SD), as all data were normally distributed. Student t-test was used to compare the variables of males and females. The correlations of the LV dimensions with continuous varia¬bles (HR, age, and weight) were tested using the Pearson correlation test. The comparison of left ventricle parameters obtained by the different methods was performed using analysis of covariance (ANCOVA) with repeated measurements to control the effects of continuous co-variables or analysis of variance (ANOVA) with repeated measurements when there were no co-variables affecting the parameter being studied or in the presence of only categorical co-variables (gender, axis, and mode). The continuous variables that correlated with any of the LV measurements by Pearson correlation test were included as co-variables in ANCOVA analysis. Whenever a continuous covariable was identified, equation regressions for each method were generated. The ANCOVA graphics showed the resultant regression lines and comparisons of whole lines were made to demonstrate the effect identified in each method and its behavior. The agreement among methods was further demonstrated by Bland—Altman plot for those left ventricle parameters that were significantly affected by the imaging mode or the axis. As a gold standard tech¬nique of measuring LV dimensions and SF was not available, Bland—Altman plot was performed in pairwise comparisons between all methods. Values of p < 0.05 were regarded as significant. All tests were conducted using a two-tailed hypothesis. Seventeen females and 23 males were selected with an age of 3.57 ± 1.78 (mean ± SD) years. The minimum and maximum ages were 1 and 7 years. The mean weight was 32.5 ± 4.4 kg with a range of 24.6—46 kg. Mean systolic blood pressure was 141.2 ± 17.3 mmHg. The minimum and maximum HR was 80 and 95 bpm. 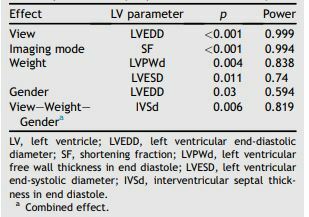 The mean, SD, and confidence intervals of the left ventricle parameters are displayed in Table 1. There were no differences in age, HR, or systolic blood pressure measurements between males and females. Males weighed more than females (34.9 ± 3.7 kg and 29.1 ± 2.7 kg, respectively (p < 0.001)). In addition, all LV dimensions were greater for males than females in at least 1 method, with the exception of SF and ejection fraction, which were similar between the genders. 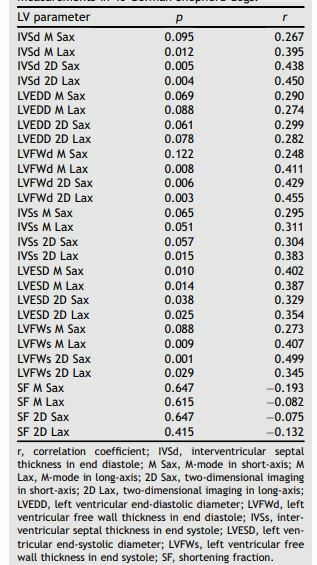 Weight correlated with all LV parameters in at least 1 method, with the exception of LVEDD and SF (Table 2). There was no correlation of the left ventricle parameters with age, HR, or blood pressure. Therefore, only weight and gender were included as co-variables in ANCOVA analysis. Table 1 Left ventricular measurements and comparisons among imaging methods in 40 German Shepherd dogs. IVSd, interventricular septal thickness in end diastole; M Sax, M-mode in short-axis; M Lax, M-mode in long-axis; 2D Sax, two¬dimensional imaging in short-axis; 2D Lax, two-dimensional imaging in long-axis; LVEDD, left ventricular end-diastolic diameter; LVFWd, left ventricular free wall thickness in end diastole; IVSs, interventricular septal thickness in end systole; LVESD, left ventricular end-systolic diameter; LVFWs, left ventricular free wall thickness in end systole; SF, shortening fraction. a Difference observed (p = 0.0024). b Difference observed (p < 0.001). c Difference between SF M Sax and SF 2D Sax (p = 0.001). d Difference between SF M Sax and SF 2D Lax (p = 0.007). An isolated effect of gender was observed on LVEDD by ANCOVA, as the males had greater values than the females in 2D (P = 0.03) in the short and long-axis views, but not in M-mode in any view (Fig. I, available in the online supplemental materials). Weight had an isolated positive effect on LVFWd (P = 0.004) and LVESD (P = 0.011) (Fig. II, available in the online supplemental materials). Although there was a significant isolated effect of view on LVEDD (p < 0.001), with short-axis values greater than long-axis, Bland—Altman plots showed reasonable agreement in LVEDD val¬ues in all pairwise comparisons (Fig. III, available in the online supplemental materials). A significant isolated effect of mode on SF (ANCOVA, p < 0.001) was observed, with M-mode measurements greater than 2D. In addition, Bland—Altman plot failed to show a good agree¬ment among methods, showing small bias but a wide range of the limits of agreement in all pair¬wise comparisons. Correlation coefficients were weak for all but M-mode in long-axis to 2D in long- axis, 2D in short-axis to 2D in long-axis pairwise comparisons of SF, which showed moderate correlation (Fig. IV, available in the online supplemental materials). A combined effect of view, gender, and weight was identified for IVSd (p = 0.006), and the males had a greater IVSd than the females. However, the effects of weight on IVSd were different according to the view and gender, leading to significant differences among methods in regression lines based on weight for males and females. In long-axis views in both imaging modes in males, IVSd showed a positive correlation with weight, and the opposite was observed in females (Fig. V, available in the online supplemental materials). The Bland—Altman plots for IVSd showed variable behavior of the bias depending on the magnitude of the measurements and pairwise comparisons, as well as low correlation coefficient for all pairwise comparisons except from M-mode in short-axis to M-mode in long-axis, thus demonstrating weak agreement among methods (Fig. VI, available in the online supplemental materials). 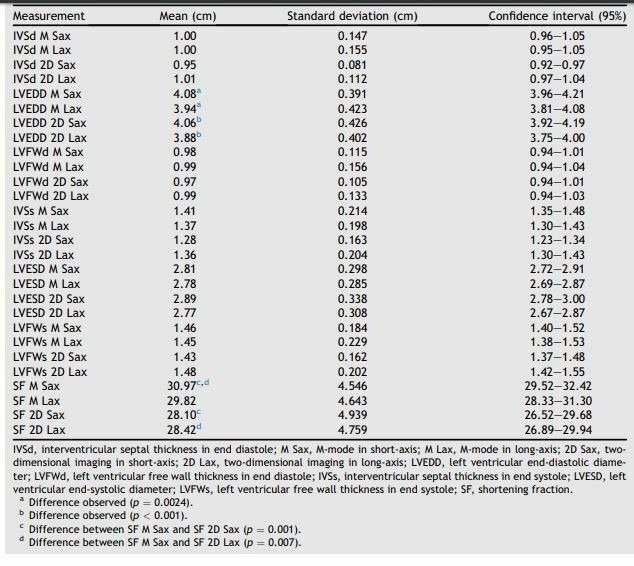 Table 2 Correlation of weight with left ventricular measurements in 40 German Shepherd dogs. r, correlation coefficient; IVSd, interventricular septal thickness in end diastole; M Sax, M-mode in short-axis; M Lax, M-mode in long-axis; 2D Sax, two-dimensional imaging in short-axis; 2D Lax, two-dimensional imaging in long-axis; LVEDD, left ventricular end-diastolic diameter; LVFWd, left ventricular free wall thickness in end diastole; IVSs, inter¬ventricular septal thickness in end systole; LVESD, left ven¬tricular end-systolic diameter; LVFWs, left ventricular free wall thickness in end systole; SF, shortening fraction. Table 3 Significant effects observed on left ventricular parameters by repeated measures analysis. LV, left ventricle; LVEDD, left ventricular end-diastolic diameter; SF, shortening fraction; LVPWd, left ventricular free wall thickness in end diastole; LVESD, left ventricular end-systolic diameter; IVSd, interventricular septal thick¬ness in end diastole. a Combined effect. Although view, gender, and weight in combina¬tion affected IVSs, the effects were insignificant when included in the ANCOVA regression model, indicating that they were too weak to be considered. A combined effect of mode, gender, and weight was observed for LVFWs, but these effects were also not significant. All significant effects on LV measurements observed by ANCOVA are displayed in Table 3. The bias and confidence intervals of the pairwise comparisons performed by Bland—Altman test are displayed in Table 4. An isolated effect of the view was detected for LVEDD by ANCOVA analysis, but Bland—Altman plot showed a good agreement among the methods. The 95% limits of agreement in all pairwise comparisons were small for LVEDD of dogs of an average weight of 32.5 kg. Therefore we considered that the difference observed among the methods, although statistically significant, was of no clinical relevance. The high sensitivity for measurements performed in one hun¬dredth of centimeters may explain the statistical but not clinical significance observed. Schober and Baade reported greater values of LVEDD, LVESD and IVSs in short-axis in M-mode, although the methods showed a good agreement and could be considered equivalent.13 That study evaluated analysis of repeatability, intra-observer and inter-observer variability, dogs with heart disease, and different breeds. It also assessed only M-mode and did not include co-variables such as weight, gender, and breed in the statistical analysis. Despite these important differences in study design, their findings are quite similar to ours as we did not find difference among methods for LVESD and IVSs and the results for LVEDD of both studies are the same. Bland—Altman plot failed to show good agree¬ment among the methods for IVSd. The variable behavior of bias among the pairwise comparisons can be explained by the interaction of gender, weight and view affecting IVSd. One factor that may have contributed to this finding is the slightly different levels at which the left ventricle measurements were performed in short and long-axis views (chordae tendineae insertion in the former and tip of the mitral valve at maximum opening in the latter). Table 4	Bias and confidence intervals of pairwise comparisons by Bland—Altman analysis. 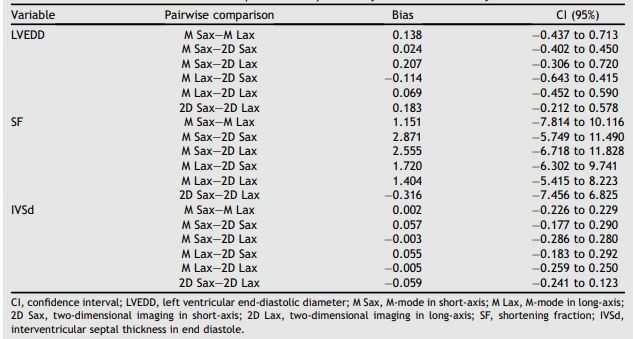 CI, confidence interval; LVEDD, left ventricular end-diastolic diameter; M Sax, M-mode in short-axis; M Lax, M-mode in long-axis; 2D Sax, two-dimensional imaging in short-axis; 2D Lax, two-dimensional imaging in long-axis; SF, shortening fraction; IVSd, interventricular septal thickness in end diastole. The other factor to take into account is the difficulty in achieving perpendicular alignment of the LV structures to the echo beam in long-axis views of many dogs. This could lead to over or underestimation of left ventricle long-axis view measurements in M-mode. The imaging mode affected SF, which was greater in M-mode. Bland—Altman plot confirmed this finding, showing a positive bias to M-mode views when compared to 2D views. It also demonstrated poor agreement among methods, as the 95% limits of agreement were too wide and therefore considered clinically relevant. In addi¬tion, 5 dogs had SF below 25% in M-mode (only 1 in both views) and 14 in 2D. Only 4 of these dogs had SF below 25% in all methods. Thus, 10 dogs (25%) showed SF below the lower limit of normality in general (not in breed specific references) in 2D imaging and within the normal reference range in M-mode. Although the imaging mode did not affect the LVEDD and LVESD measurements, it had an effect on the SF. The LVEDD was slightly greater, although not significantly, in M-mode. This insig¬nificantly increased value probably gained importance in the equation used to calculate SF and resulted in significantly greater SF values. The use of echocardiographic ratio indices has been reported in the literature, and the major advantage of this approach is the minimization of any dependence on weight, especially when using the estimated aortic root dimension by weight as described by Brown et al.26 However, in a meta¬analysis study using echocardiographic ratio indices based on the estimated aortic root dimension, Hall et al. found that the breed and echocardiographic method affected the cardiac measurements,27 which is consistent with our findings. Although the examiner was experienced in all measurement techniques, an important limitation of this study is the lack of intra-observer and inter¬observer variability testing. The addition of this procedure could reduce the possibility of meas¬urement errors affecting the final results. German Shepherd dogs are deep chested dogs, and it was not always possible to achieve a good alignment of left ventricle structures that should be ideally almost per¬pendicular to the echo beam. This fact could also have influenced our results. However, as breed is a known source of variationon expected LV dimen¬sions, it does not invalidate the findings, as the interchangeable use of measurement methods could enhance erroneous interpretation of the left ventricle dimensions and function. The echocardiographic measurements of the LV can be affected by the methods used to acquire them, although the differences observed are not always clinically relevant. Therefore, examiners should interpret left ventricle measurements with caution when using the methods interchangeably. None of the authors declare any potential conflicts of interest. Kienle RD. Echocardiography. In: Kittleson MD, Kienle RD, editors. Small animal cardiovascular medicine. St.Louis: Mosby; 1998. p. 95-117. Lombard CW. Normal values of the canine M-mode echo¬cardiogram. Am J Vet Res 1984;45:2015-2018. Morrison SA, Moise S, Scarlett J, Mohamed H. Effect of breed and body weight on echocardiographic values in four breeds of dogs of differing somatotype. J Vet Intern Med 1992;6:220-224. Della Torre PK, Kirby AC, Church DB, Malik R. Echocardio- graphic measurements in Greyhounds, Whippets and Italian Greyhounds - dogs with similar conformation but different size. Aust Vet J 2000;78:49-55. Cornell CC, Kittleson MD, Della Torre P, Haggstrom J, Lombard CW, Pedersen HD, Vollmar A, Wey A. Allometric scaling of M-mode cardiac measurements in normal adult dogs. J Vet Intern Med 2004;18:311-332. Bonagura JD. M-mode echocardiography: basic principles. Vet Clin North Am 1983;13:299-319. Bonagura JD, O'Grady MR, Herring DS. Echocardiography: principles of interpretation. Vet Clin North Am 1985;15: 1177-1194. Boon J. Evaluation of size, function and hemodynamics. In: Boon J, editor. Veterinary echocardiography. 2nd ed. Ames: Willey-Blackwell; 2011. p. 153-266. Boon J, Wingfield WE, Miller CW. Echocardiographic indices in the normal dog. Vet Radiol 1983;24:214-221. Jacobs G, Mahjoob K. Multiple regression analysis, using body size and cardiac cycle length, in predicting echocardiography variables in dogs. Am J Vet Res 1998;48: 1290-1294. Sisson D, Daniel GB, Twardock AR. Comparison of left ventricular ejection fractions determined in healthy anesthetized dogs by echocardiography and gated equilibrium radionuclide ventriculography. Am J Vet Res 1989;50: 1840-1847. Sisson D, Schaeffer D. Changes in linear dimensions of the heart, relative to body weight, as measured by M-mode echocardiography in growing dogs. Am J Vet Res 1991;52: 1591-1596. Schober KE, Baade H. Comparability of left ventricular M- mode echocardiography in dogs performed in long-axis and short-axis. Vet Radiol Ultrasound 2000;41:543-549. Silva CES, Ortiz J. O exame em modo M. In: Silva CES, editor. Ecocardiografia. Principios e Aplicacoes Clinicas. Rio de Janeiro: Livraria e Editora Revinter Ltda; 2007. p. 93-102. Thomas WP, Gaber CE, Jacobs GJ, Kaplan PM, Lombard CW, Moaise NS, Moses BL. Recommendations for standards in transthoracic two-dimensional echocardiography in dogs and cats. Echocardiography Committee of the Specialty of Cardiology, American College of Veterinary Internal Medi¬cine. J Vet Intern Med 1993;7:247-252. Muzzi RAL, Araujo RB, Muzzi LAL, Pena JLB. Ecocardiografia modo M em caes normais da raca pastor Alemao (origem americana) do canil da Policia Militar do Estado de Minas Gerais, Brasil. Ciencia Rural 2000;30:819-824. Kayar A, Gonul R, Or ME, Uysal A. M-mode echocardio- graphic parameters and indices in the normal German Shepherd dog. Vet Radiol Ultrasound 2006;47:482-486. Crippa L, Ferro E, Melloni E, Brambilla P, Cavalletti E. Echocardiographic parameters and indices in the normal Beagle dog. Lab Anim 1992;26:190-195. Page A, Edmunds G, Atwell RB. Echocardiographic values in the Greyhound. Aust Vet J 1993;70:361-364. Vollmar AC. Echocardiographic measurements in the Irish Wolfhound: reference values for the breed. J Am Anim Hosp Assoc 1999;35:271-277. Bavegems V, Duchateau L, Sys SU, De Rick A. Echocardio¬graphic reference values in Whippets. Vet Radiol Ultrasound 2007;48:230-238. Gooding JP, Robinson WF, Mews GC. Echocardiographic assessment of ventricular dimensions in clinically normal English Cocker Spaniels. Am J Vet Res 1986;47:296-300. O'Grady MR, Bonagura JD, Powers JD, Herring DS. Quanti¬tative cross-sectional echocardiography in the normal dog. Vet Radiol 1986;27:34-49. Bayon A, Del Palacio JF, Montes AM, Panizo CG. M-mode echocardiography study in growing Spanish Mastiffs. J Small Anim Pract 1994;35:473-479. Hanton G, Geffray B, Lodola A. Echocardiography, a noninvasive method for the investigation of heart morphology and function in laboratory dogs: 1. Method and reference values for M-mode parameters. Lab Anim 1998; 32:173-182. Brown DJ, Rush JE, MacGregor J, Ross Jr JN, Brewer B, Rand WM. M-mode echocardiographic ratio indices in nor¬mal dogs, cats, and horses: a novel quantitative method. J Vet Intern Med 2003;17:53-62. Hall DJ, Cornell CC, Crawford S, Browns D. Meta-analysis of normal canine echocardiographic dimensional data using ratio indices. J Vet Cardiol 2008;10:11-23.